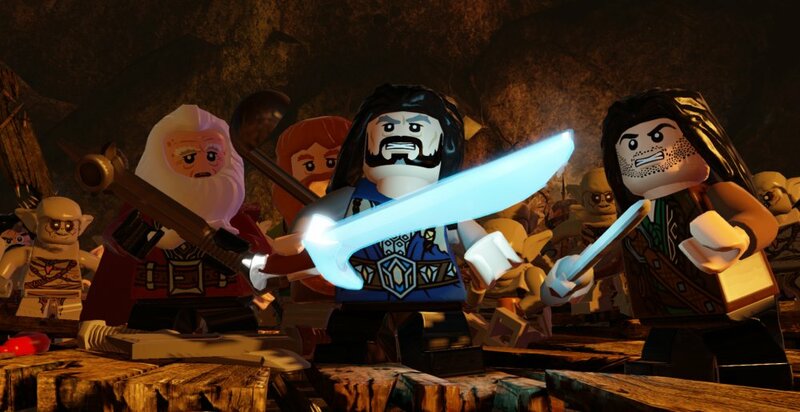 In LEGO The Hobbit, kids and families will be able to take on the form of their favorite Hobbit characters, including Bilbo, Gandalf, and all of the Dwarves: Thorin, Fíli, Kíli, Óin, Glóin, Dwalin, Balin Bifur, Bofur, Bombur, Dori, Nori and Ori. Each has his own special – and quite hilarious – ability: For instance, Bombur can be used as a trampoline that enables his companions “belly-bounce” out of danger! Players will visit key locations from the films, including Bag End, Bilbo’s Hobbit-hole in Hobbiton, trek through the treacherous High Pass over The Misty Mountains, and explore the depths of Goblin-town, Mirkwood and Rivendell. Along the way, players will solve countless puzzles, partake in Treasure Quests and battle with Orcs, Trolls and fouler things. They will also be able to mine for gems, discover loot from enemies, and craft powerful magical items or build immense new LEGO structures. While LEGO The Hobbit won’t be here in time for the 2nd film (releasing on December 13th), we will see it for a 2014 release. All current, major platforms will receive a version as well. Page created in 0.3332 seconds.